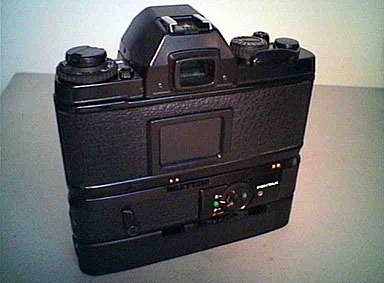 Is your Pentax Ni-Cd Battery Pack LX unreliable? 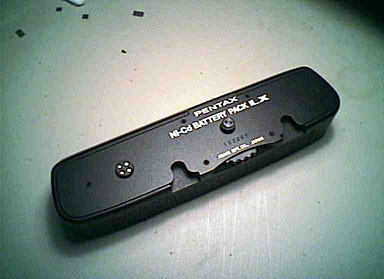 My Pentax Ni-Cd Battery Pack LX was not able to retain a charge for more than a day and would only serve to cover a couple of films so I decided to repair it and to document and publish the procedure. 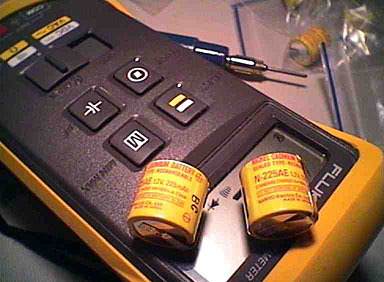 The eBay trader All-Batteries Outlet sells great volumes of batteries and has been selling sets of 12 x 1/3AA 280mAh Ni-MH cells for only US$12.99 plus shipping. The on-line trader Batteries America has also supplied 1/3AA cells and as a bonus can also apparently produce welded stacks to your requirements. I am not affiliated with these seller in any way, I'm just passing on the information and as per any on-line transaction beware. So it appears that the procedures below can be used as a guide to refurbishment Ni-Cd Battery Pack M with the caveat that the cells be configured in two stacks of two (2 x 2 cells) and two stacks of four cells (2 x 4 cells). Thanks to Bob S for permission to reproduce his images. 1. 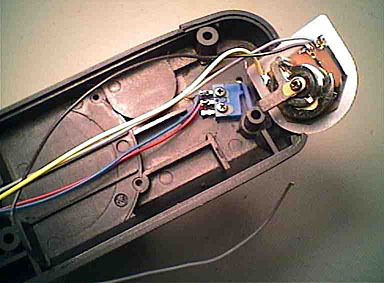 Remove the six small counter sunk screws on the top plate of the Ni-Cd Battery Pack LX to reveal the casing screws. 2. 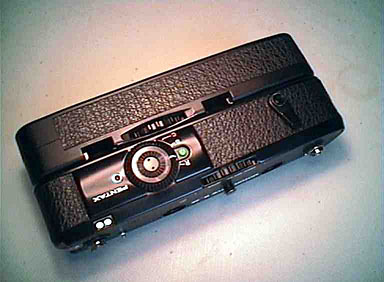 Remove the six screws around the casing perimeter, these screws are long self tapping types which screw into plastic. The three screws in the middle of the casing under the thumbscrew are shorter and have a machine thread, these screws hold the tripod stud in place. 3. 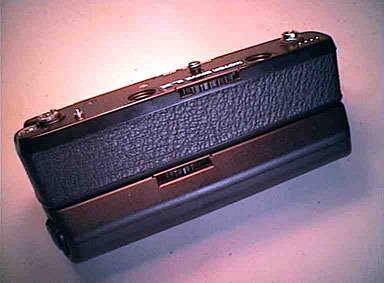 Once the screws are fully removed the casing may be gently split, the vinyl body cover should unstick from the two halves of the casing, be gentle to avoid damage. 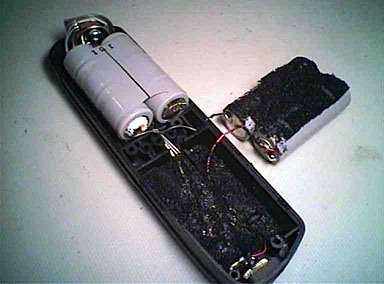 Don't tip the assembly sideways or the cells may drop out and damage the internal wiring. 4. Once the casing is open visual inspection of the cells may reveal chemical leakage (white crystals etc) around the battery terminals or tags, you should check for significant damage to other components from these chemicals. 5. 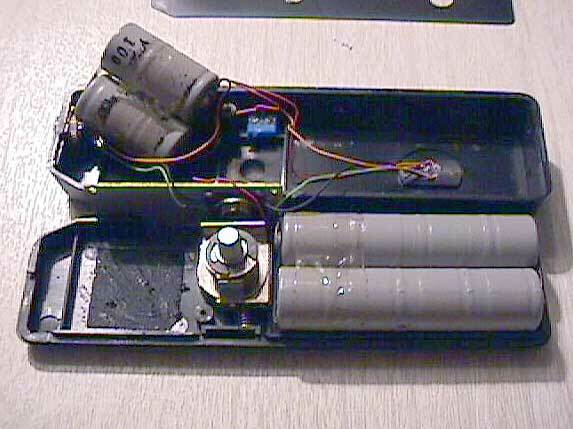 Removing one of the battery assemblies may reveal the next problem, foam that has deteriorated to become a sticky black mass. This mess must be removed but first desolder the red and black connections to the two sets of cells and desolder the bridge wire between the two sets of cells and discard the old cells. 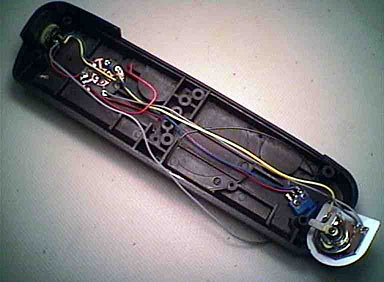 Take careful note of the wire positions as they are critical for correct reassembly. 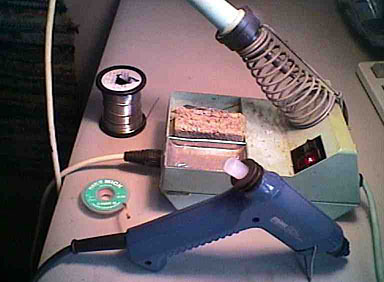 Remove any solder dags carefully using the desolder wick. 6. Scrape as much of the old foam away as possible (careful not to damage the wiring) and remove the remaining foam and adhesive using cotton bud cleaning sticks moistened with metholated spirits. The old foam and adhesive becomes tacky and gets stuck to the cotton so the more cotton buds used the easier the job becomes. 7. When the casing is clean and dry the wiring should be tucked back in the recesses and channels provided (I cheated and used a dab of hot melt glue to help hold the wires). When all the wiring is placed correctly the new foam may be applied, 4 x 50mm x 8mm strips placed as per the photographs above. 8. The cells must be divided into four groups of three cells, the positive tab (+) of the top cell and the negative tab (-) of the bottom cell in each set should not be trimmed till later, it may help to identify these tabs with a red permanent marker. 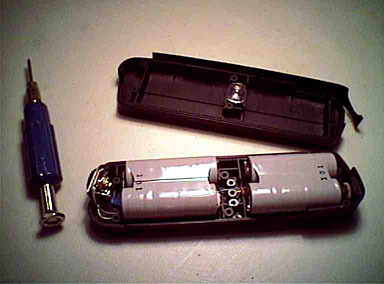 The batteries are supplied with the solder tabs folded toward the body of the cell which must be straightened using the flat blade pliers. 9. 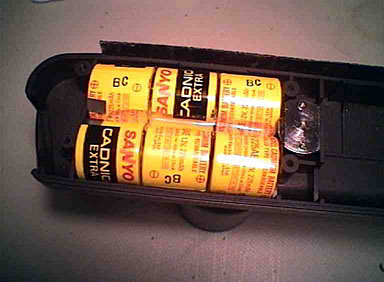 The tabs on each cell which connect to an adjacent cell then need to be tinned (very lightly coated with solder, eg quickly heat the surface to be tinned and feed the solder gently into the junction between the iron and the surface) and trimmed. The positive tab (+) should be cut just shorter than the diameter of the cell and the tip lightly tinned on the top (being very careful not to heat damage the heat shrink plastic cell skin underneath). The negative tab (-) should be cut about 3mm past the cell. The cell should then be placed negative down and the protruding tab should be lightly tinned on the upwards facing surface. 10. Adjacent cells may be connected by sweating after they are correctly tinned. Place two cells to be connected next to each other, tabs facing (careful not to short circuit other tabs) and lay the tinned surfaces of the tabs against each other then quickly apply heat the soldering iron to the joint whilst keeping the assembly still. The tabs should come together and a small ball of molten solder may roll out of the joint. 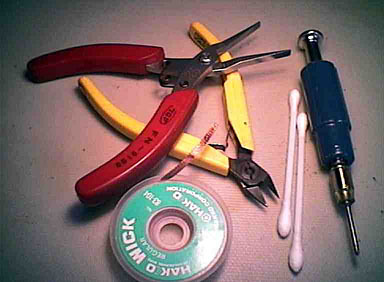 Carefully remove any solder balls that occur and check for damage to the heat shrink plastic cell skin. 11. If the connection procedure as described above was successful you should be able to fold the two cells end to end to form a stack. Squirt a small dab of hot melt glue into the small gap between the stacked cells and hold the cells in the required position (eg keep them tight and parallel). Add another cell to make the stack three cells high. Check the cell to cell voltages using the multi-meter (there will be some remanent charge in the cells, each cell should add about 1.2 volts). Make another three 3 cell stacks. 12. When the 4 stacks of three cells are complete they need to be assembled into two dual three cell assemblies. 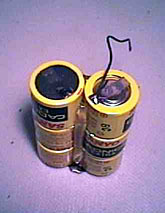 Drop two stacks of three cells into the top of the casing positioned so that positive tab (+) and the negative tab (-) which need to be connected are crossed at about 45 degrees for soldering later. The two stacks of cells can then be glued down the centre with a bead of hot melt glue. 13. 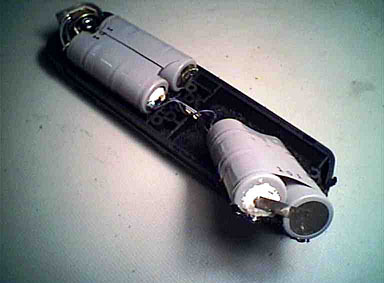 The assembly can then be removed from the casing and glued on the opposite side. The tabs bridging the two sets of cells can now be soldered, trimmed and folded. The bridge wire between the two sets of cells can now be re-attached as per the original installation. 14. 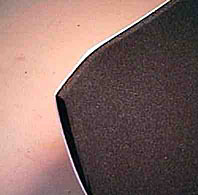 The cells can now be placed back in the casing on the foam as per the original cell orientation. 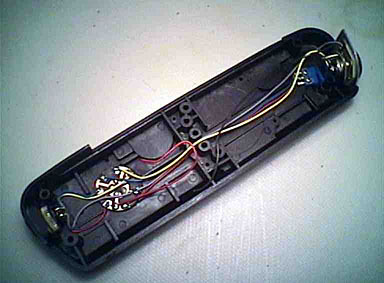 The red and black wires should be repositioned and re-soldered. 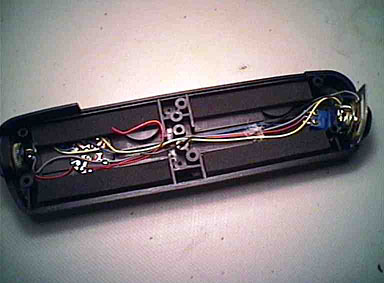 Check all the connections and make sure that no wires will be crimped when the unit is reassembled. Check the cell to cell voltages using the multi-meter. 15. 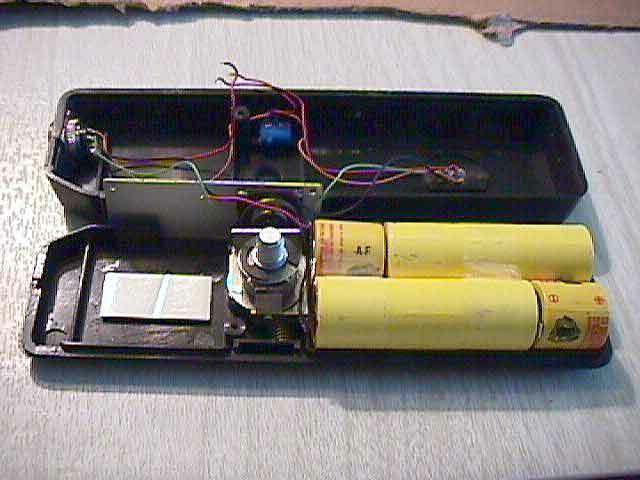 The top of the casing can now be replaced and the screws re-fitted. 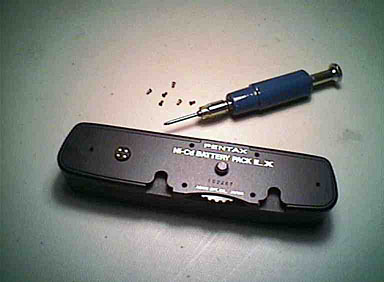 The longest screws should be loosely screwed in place around the perimeter of the case. 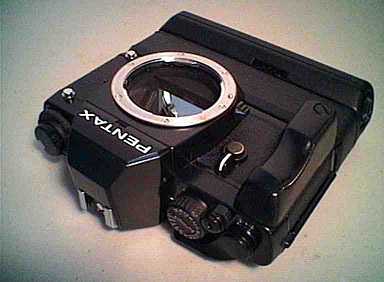 The unit should be gently compressed as the screws are tightened. 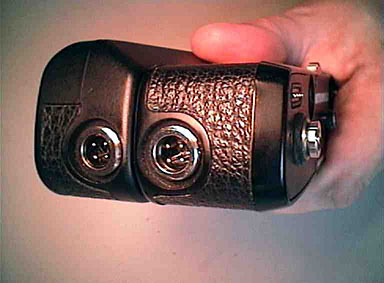 Do not over tighten these screws as the thread into the casing can be easily destroyed. 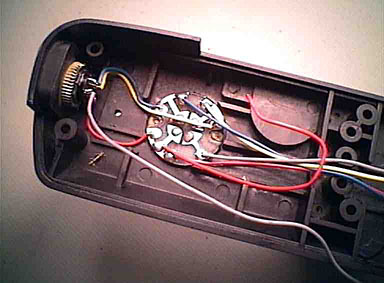 Replace the 1/4" thumb wheel and shims, the top plate then the remaining small counter sunk screws. Press the vinyl covering back into place. 16. With the power switch on you should be able to measure be a voltage across one of the pairs of of diagonal contacts on the connector at the top of the Pack. 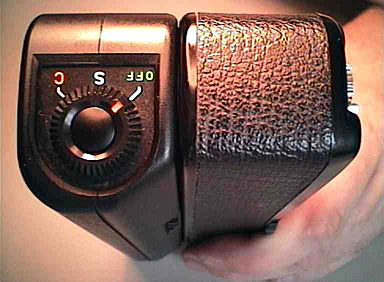 The Pentax Charge Pack M can be connected to the pack for charging, the indicator lamp on the Charge Pack M may help to confirm correct operation. 17. 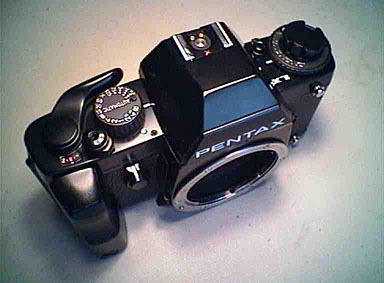 The refurbished battery pack capacity using the Sanyo cells is nominally 14.4v @ 225mAh (3.24Wh), using the the Pentax Charge Pack M (charge current 25mA) the new pack would require approximately 12 hours be fully charged (assuming the original batteries were 110mAh @ 6 hour charge). Clicking on a thumbnail will yield a magnified image, use the browser back button to return. Cadmium is poisonous, it's effect is cumulative, poisoning can occur by ingestion and/or absorption. 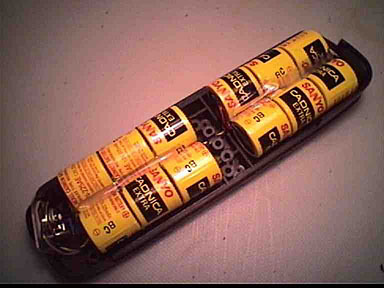 Items containing Cadmium may also be illegal to dispose of by normal means in your location. 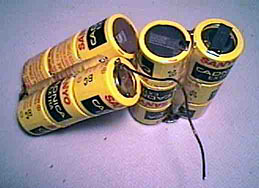 Ni-Cd batteries should not be subjected to over-charging or short circuits as they can become hot and/or explode. 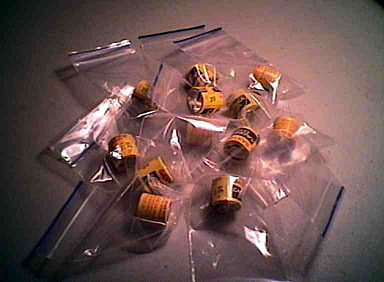 The images in this article were captured under fluorescent lighting using a small video camera mounted on a miniature Velbon tripod that was connected directly to a computer and video capture card. Extreme jpg compression was used in order to significantly reduce the file sizes in this publication.